Stay cool and safe thanks to the Sedici Arturo Mesh Pants. Internal armor at the knees keeps you protected while the mesh outer shell lets the air breeze through. Ok so I got these pants in today and after checking them thoroughly I didn't see and defects in them so I decided to take a quick ride down the road and test them out. First off they fit really well, kinda like a loose pair of jeans that you can wear some gym shorts under. I wear a 38 in jeans and I ordered a 38, good fit. On the bike they are really comfortable they sit just above my boots and the don't flap around like jeans do, they are heavy though so that helps keep them from flapping in the wind. I don't have any issues with the knee pads although I might stitch the pocket up so they line up with my knee a little better but overall not bad. One thing that is not mentioned is that they have pockets for hip armor which is a nice feature. Now as far as how "cool" they are I have to say it was in the low 90s while I was out riding and speeds varying from 15 to 60 mph, now they do flow a good amount of air but I did notice that I had to spread my legs a bit to get the wind to flow through, I ride a CBR500R and the fairings block a good bit of the wind and heat from the engine is directed towards your legs which is great for the winter but miserable in the summer. Overall I think this was a good purchase, living in the southeast US it gets hot and humid so I like to wear shorts most of the time, these pants will allow me ride in shorts so I can stay cool but with added protection. As far as the inner liner it is zipped in at the top and has two snap loops on each leg, I can't speak for the windproofing or waterproofing but it looks exactly like my jacket liner which is windproof and waterproof so I would gamble that it does work. I got these pants with the hip pads after a slight delay in making sure all items were in stock before shipping to me. I did not get a change to use the pants and pads right away, but I just finished a 200+ mile ride this past Saturday. The pants worked great, as they allowed me to stay cool while riding in 90 degree temps in southern CA. In fact, the temp started out in the mid 60's but I rode throughout the day in high 80's to mid 90's with no problems. I added the hip pads to the pants since it had hip pad pockets. I rode on the freeway and although not cow hide leather, I did feel more confident having the pants on than with just regular jeans. I am size 30 waist on most all my pants jeans and dress pants. I purchased the size 30 and fit perfectly alone or with over a pair of jeans. The pants have good amount of adjustment. The knee pads fit me perfectly and I do not have to worry that they will be where they need to be in case of a fall. I am happy with the purchase and would recommend the pants to anyone riding in hotter temps. I always wear Mesh pants OVER a pair of shorts. Other pants are too snug in the waist, but the next size always is too large. These have some elastic portions in the waist, so a size 32 fits over the shorts. Both pants and jacket have liners, so they are 4-season, depending on the area of the country -- probably not for cold weather. My only 'dis' is that the leg zippers are so short that shoes must be removed before putting pants on or off. I'll manage. I just bought these mesh pants today and only have one S. Calif. hot ride to judge the results, but so far I really like them. I usually wear blue jeans and leather chaps. We are going on a late June 5-day ride through the west this week and it will be in the 90's to over 112 degrees on some of the days. I figured I needed to upgrade my comfort level just to survive. The first ride hints that this will be a big improvement. One caution: the sizing runs large. I am a 34 waist and first bought a 34. When I tried them on the knee pads were below my knees and I couldn't fully cinch the waist, although this was with just the HeatOut undergarments on with no shorts or jeans. I went back for a pair of 32's (haven't worn a 32 in 10 years!) and it fit perfectly. They also fit well over shorts, but may be a bit tight over jeans. Of course, my reason for getting them was to stay cool, so I plan to wear only shorts underneath. My tip--if ordering online, go one size smaller than you think unless you plan to wear full clothing underneath. If in the store, try them on. One other nice thing...there is a zipper in the back to attach to a similar jacket for use in the rain. I have a Tourmaster mesh jacket, but the two zippers are compatible. Apparently it is some kind of standard, although based on the quality of the pants I would check out the Sedici jacket if I didn't already own a different brand. 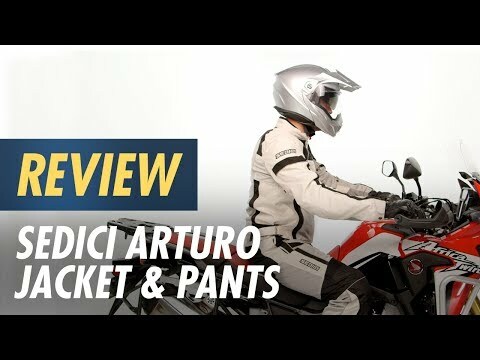 I have owned my Sedici Arturo jacket and pants for about 6 months and have used them on both long and short trips. I am 5'9" tall, 188# and usually wear a size 36 waist 30 inseam. I find the size 34 pants fit very well and are comfortable on long rides. The liner makes them rather warm and I find that even in cold weather, I do not need much under them. I have not worn them much in the rain to test how waterproof the liner really is. If it is going to be seriously wet, I cover with my rain suit over the top. I have had no issues with any of the seams, zippers, pockets, snaps, etc. They are easy to get on or off and I can zip them to each other without help. The material, design, look, overall usefulness is just great. I have about 3000 miles on these pants. Rain and 50's and sun and 90's. They have kept me warm and dry and they are just as cool as jeans. I wear them with shorts underneath. The reason they did not get 5 stars is that the last ride I was on I put the rain liner back in. I was sitting on a porch at a store not in a hurry and put the liner back in. After stewing in my own sweat after the rain I took it out and the zipper was not secure on one side. It took quiet and effort to remove it. Hopefully it was just me and they are fine. Just received my pants and they fit very well and are very comfortable. They are exactly as described. Have not taken a trip in them yet, but am sure they will work out great! 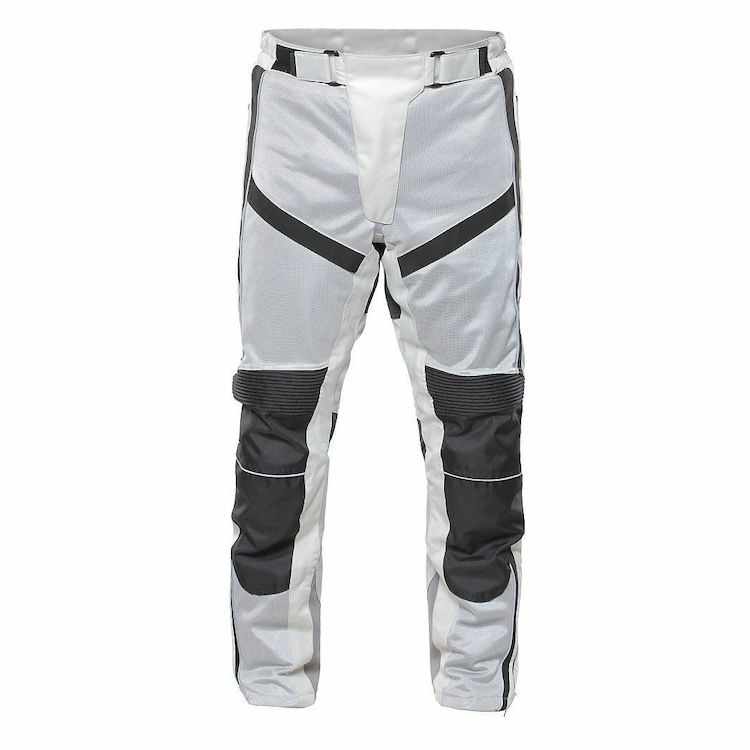 These pants are the best all season riding pants I've ever owned. Comfortable enough to wear anything underneath. This is the only seduci pants that actually fit a 5'9" guy with 32" waist. The other models run way to long. I need a 38 in the Sedici Arturo Pants, but what they have in the store are too long in the legs for me. Do they come in a shorter inseam? BEST ANSWER: I’m a 30” inseam and these look too long when I’m off the bike, but when riding they’re a good length on top of my boot, helps to keep me dry. If I am 34 32 in jeans what size should I buy? I want to use them as over pants. BEST ANSWER: I purchased a size 34 and had to return for 32-34. They have elastic in the waist and stretch a lot. 34's kept falling down. I am a 34 or 36 in jeans. I bought 36 and have plenty of room for pants underneath.